Violet Leaf Absolute is well respected for its relaxing, soothing and inspiring properties. It has long been used to treat congestive pulmonary and sensitive skin conditions. Its scent is also thought to comfort in times of grief. The Viola plant (Viola odorata) is a tiny perennial plant grown mostly for its ornamental dark violet or white flowers. It is native to Europe and Asia, but has also been introduced to North America and Australasia. It is also known as Sweet Violet, English Violet, Common Violet, or Garden Violet. The sweet, unmistakable fragrance of Violet has been popular for centuries, particularly in the late Victorian period and it has long been used as an ingredient in many cosmetics and perfumes. Both the leaf and flowers also have a long tradition of use in herbal medicine. It has historically been used to treat congestive pulmonary disorders and sensitive skin conditions. In India, where it is known as Banafsha, it is commonly used to treat sore throats and tonsillitis. Its scent was also believed to comfort and strengthen the heart during times of grief. Violet Leaf Absolute essential oil has an earthy, leafy, herbaceous aroma with subtle floral notes. It is solvent extracted from the leaves of the plant resulting in a very thick, green substance that is almost solid at room temperature (needs warming in order to make the oil mobile). In modern aromatherapy the oil is used for its soothing and comforting effect on both the mind, skin and body. As with most expensive absolutes and essential oils, Violet Leaf is also used as an ingredient in high end perfumes. 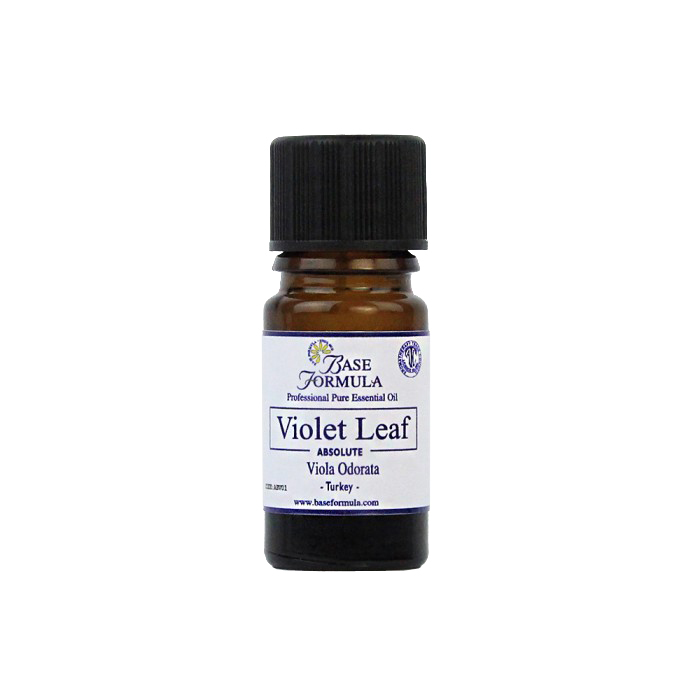 Violet Leaf Absolute essential oil helps to soothe and comfort sensitive, dry, itchy, red skin. It makes an excellent moisturiser and emollient and is particularly useful for eczema and dermatitis. It is good for oily skin and acne as it has antiseptic properties and helps to gently tighten and refine the pores. It can also help reduce the appearance of thread veins. Violet Leaf oil is believed to comfort grief and loss and encourage independence and acceptance of change. It can also be beneficial for stress and insomnia. Violet Absolute is soothing and cooling and can be used to treat swellings and bruises. It can also be helpful for bronchitis, stress headaches, rheumatism, poor circulation and sore throats. Blends well with: Clary Sage, Lavender, Benzoin, Cumin, Basil, Everlasting and Mimosa.